The Under Armour Locker Tee is one of the most versatile tees in the market, it can be used for various activities and purposes such as running. It comes in a variety of bold colours, such as red, black, white, royal blue and carbon heather, and it also comes in Youth sizing (for teenagers aged 11 to 16) and both men’s and women’s cuttings. 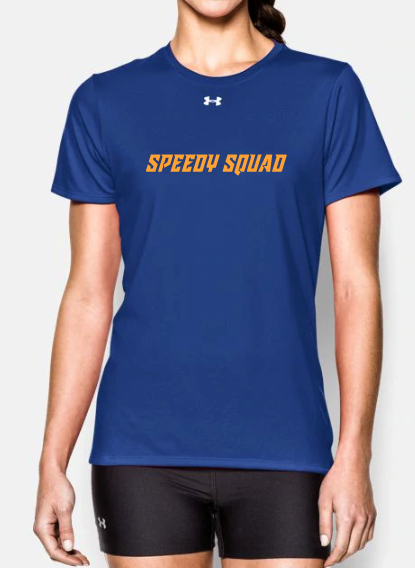 It is the perfect outfit for teams which comprise of people from all ages and both genders. At Ark Industries, we supply and also offer customised printing services for Under Armour Singapore and their Locker tees. This is one of our bestselling tees as it is reasonably priced, easily customised with print or embroidery embellishments and has a wide range of sizes available (XS to 2XL). Under Armour is also one of the hottest brands of sportswear currently. People feel good when they are wearing a premium brand of sportswear with great style and great quality assurance. After you have decided to go with Under Armour Singapore Locker tees, what are some of the customization that you can do? 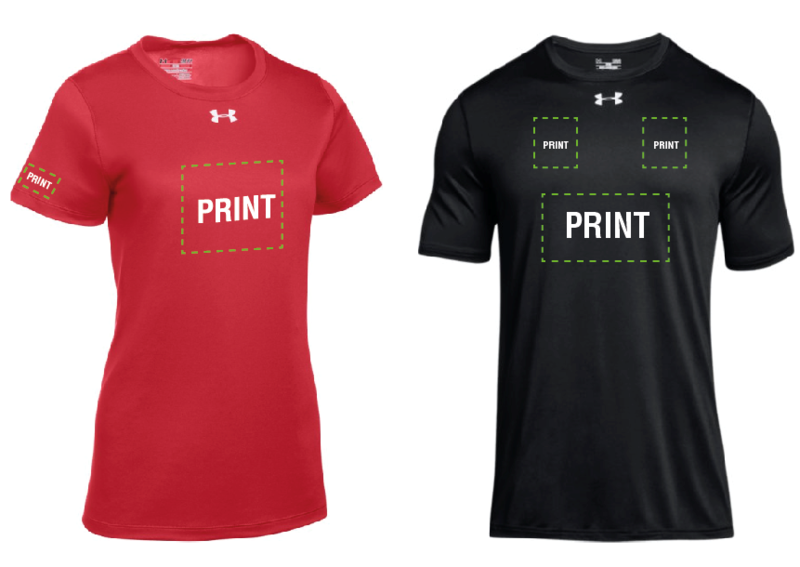 We will be introducing the 3 most popular methods to customise Under Armour Locker tees. Are you planning to purchase Under Armour Singapore Locker tee in bulk for your colleagues, such as a uniform for taking part in marathons together? Are you planning to purchase Under Armour Locker tees for sale in your Gym and print your gym logo on the apparel? 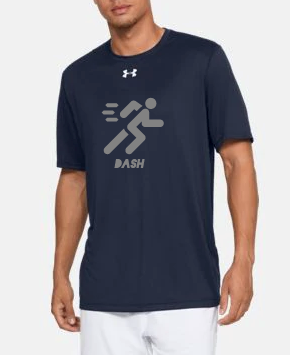 For bulk printing, we would recommend customizing your Under Armour apparel via silkscreen printing as it is the most economical printing option. It is common to see companies printing their logos on the right/left chest of the locker tee, with the company name or the event name at the back of the locker tee. Silkscreen printing is suitable if your design is bold, has few colours and no gradients or tones required. With silkscreen printing, we can also achieve unusual effects such as glitter print, puff printing, or even foil printing. Are you planning to purchase Under Armour Singapore Locker tees for your soccer team or running squad in Singapore? Are you planning to buy Under Armour locker tee as your family outfit to encourage a healthy lifestyle together? Vinyl printing could be the right print for you. Vinyl prints comes in many different colours ranging from neon to reflective. Your desired artwork, logo or text is cut out by a special machine before being heat pressed onto the Under Armour Locker tee. Advantages of vinyl printing is that it can be done on small quantities, even on a single piece of Under Armour Locker tee. We can do customization such as printing individual names on the sleeves of the Under Armour Locker tees. Choose different colours, such as neon pink for the daughter, cheerful yellow for mum and royal blue for dad. If you have a multicoloured illustration, artwork or logo, the digital print method might be suitable for your order. Your desired artwork will be printed out on a vinyl before being heat transferred unto your chosen apparel. Unlike vinyl prints, digital prints can be made of many colours and gradients. In some cases, we can heat press both vinyls and digital prints onto 1 tshirt. Perhaps your logo’s text can be plotted from a vinyl roll that we have and the pictorial logo has to be plotted out by the digital print machine.